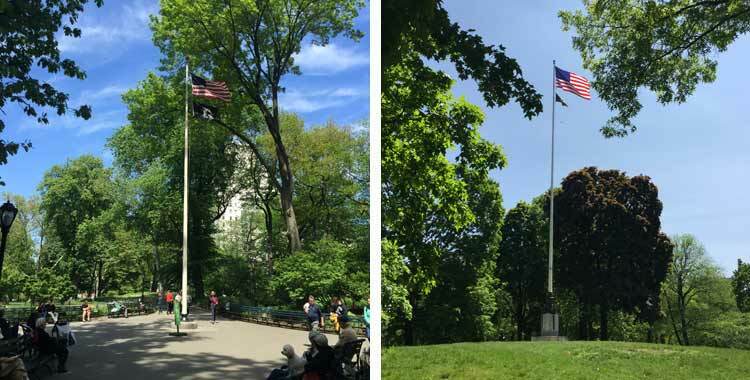 This flagpole was installed in 1928 to memorialize employees of the City of New York killed in service. Though its original intention was likely to honor those lost during World War I, it has since come to honor and recognize those killed in any United States war. The four round seals above the inscription represent the City of New York, the State of New York, the United States Army, and the United States Navy. This flagpole honors civilian members of the Red Cross who served during World Wars I and II. It was installed shortly following the end of World War II by the Women’s Overseas Service League. The WOSL was founded in 1921 by a group of Red Cross nurses who’d served in World War I. The group was founded to provide financial support and camaraderie for female nurses who returned from the war without the same benefits as their male counterparts.